I awoke Thursday morning in a parking lot overlooking the beach. It had been too dark the previous night to see what a perfect spot it was. I got outside and walked around. The beach was littered with remnants of small structures. Recurring floods in the 1960s caused massive amounts of property damage, driving away many residents. Tropical storms in in 1976 and 1977 and the catastrophic flooding they caused broke the spirits of those who remained. Pretty much everything was covered in a salty crust. Because Salton Sea sits at such a low elevation, it has no outlets, which means the salt carried in by runoff has nowhere to go. At 44 parts per thousand, water has a salt concentration 25% greater than the Pacific Ocean. 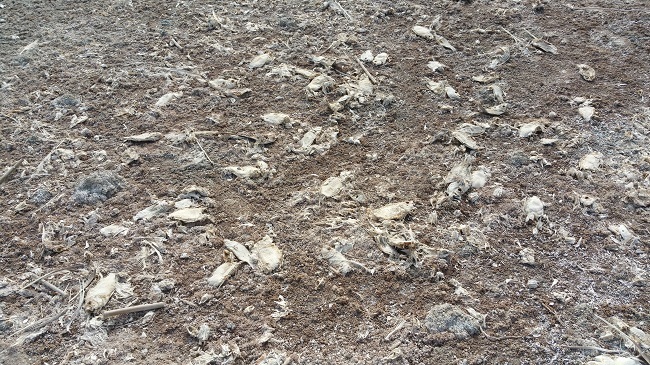 Near the water, instead of sand, the beach was a bed of fish bones. Massive fish and bird die-offs occurred in the '90s. * 1992: an estimated 150,000 water birds died. The cause has never been definitively identified, but contaminants in the water are suspected. * 1996: Botulism from agricultural runoff killed over 1000 brown pelicans in the largest documented die-off of an endangered species. It also killed 15 to 20 percent of the western population of white pelicans. * 1999: In August, 7.6 million tilapia and other fish species died when an algae bloom severely depleted the oxygen levels in the sea. 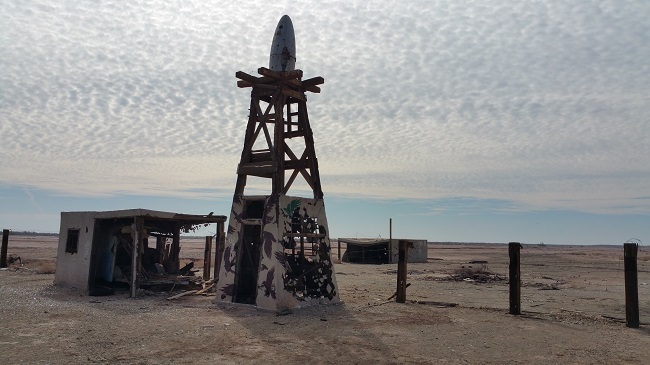 As I headed over to look at a piece of machinery lying on the beach, caked in salt and rusted all to hell, a guy in a pickup drove up to it first. He glanced at me nervously a few times as I walked up, then asked me it was okay for him to be there. I almost laughed because I'd been a little nervous too, unsure if the beaches were privately owned. Such was the case with many of the places I intended to visit. So I did my best to keep a low profile, dressing in dull colors and not carrying anything that could be used for vandalism. I carried myself with an air of confidence that I hoped would make it look like I belonged there, or at least had no idea I was trespassing. The guy with the pickup was in his early thirties, as was I, and had my first name. James told me he lived in Arizona and drove big rigs for a living. 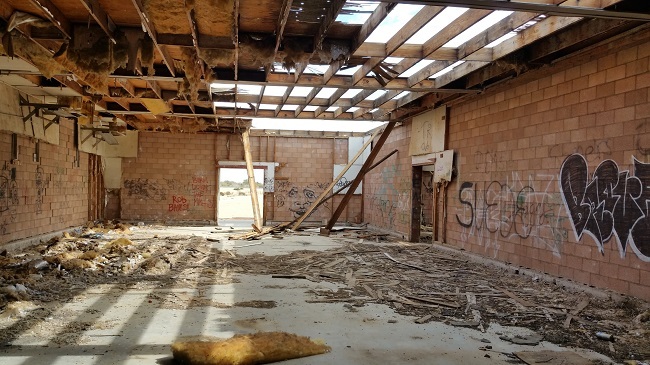 He said he was checking out the Salton Sea so he could cross it off his bucket list, and that he had left home early that morning without telling his girlfriend. He spoke in a boastful tone without any indication of anxiety or guilt, and I figured he was probably exaggerating, or else had a very dysfunctional relationship. James commented that the beach didn't smell as bad as he'd heard it would. I agreed, having noticed the same thing. 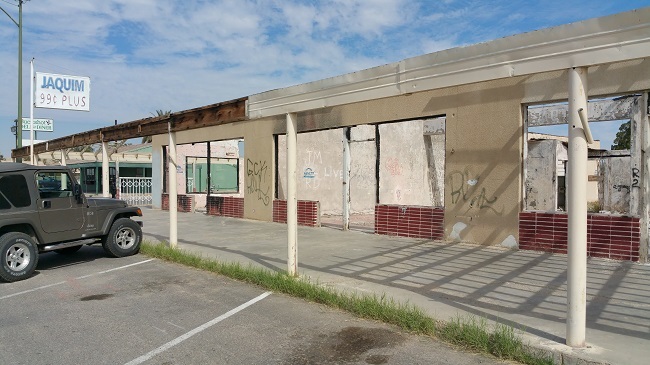 It made me sad to think of how people had once flocked to Salton Sea's shores to experience the flourishing vacation paradise, but now the only visitors came to see the destruction and decay that had befallen it. And James and I stood there casually reinforcing the region's sad new identity as a place that was. After he drove off I got back in the car and worked out a tentative route for the day. 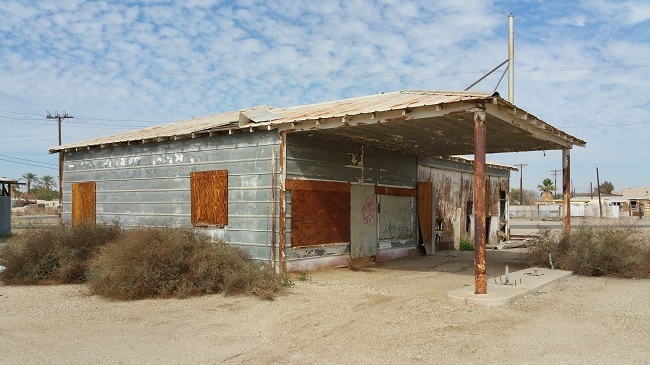 I originally thought I'd explore the Salton Sea on the first day, and then head to the ghost town of Amboy on day 2. But the beauty of the sea and abundance of abandoned places around it convinced me to slow my pace. 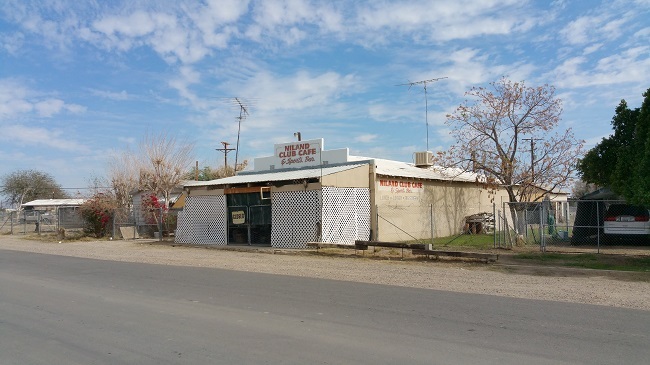 I decided to drive clockwise around the Salton, checking out as many places as I could before it got dark, and hopefully be ready to head East in the morning. 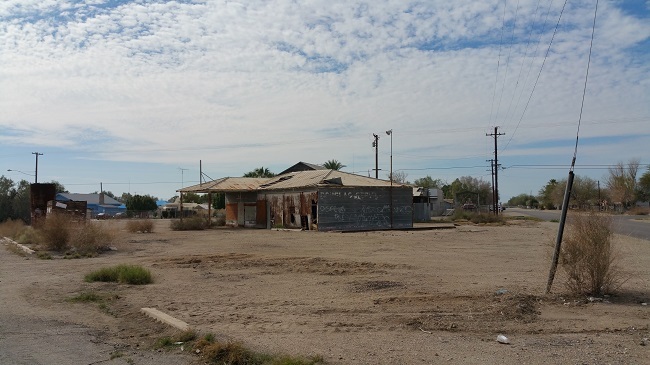 I drove over the dike that protects Bombay Beach's homes from flooding, and got my first view of the town in daylight. Two women stood outside a badly vandalized house, snapping photos of the graffiti-covered walls while their car idled nearby. I looked down the unpaved road and saw that nearly all of the houses had smashed windows and were heavily tagged with spray paint. It was strange to think that those vandalized shells had once been coveted vacation homes, built along the road closest to the beach. I drove through the devastated neighborhood, where the majority of homes appeared to be vacant. Some had been left in a hurry. Clothes lay scattered across a rotting floor, a couch with three broken legs sat decomposing against a living room wall. There was even a dusty box of macaroni and cheese inside one of the kitchen cabinets. I headed down toward Niland, at the southeastern end of sea. There were a few interesting sights on the way. 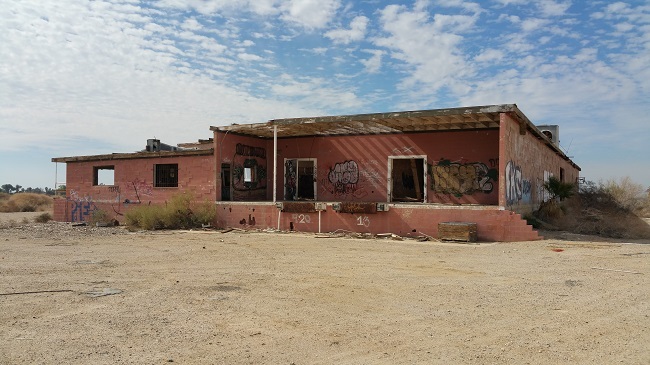 At the outskirts of Niland I stopped to check out a big abandoned building that might have once been a store. I hadn't heard anything about it during my research, and was excited to find another awesome site by accident. 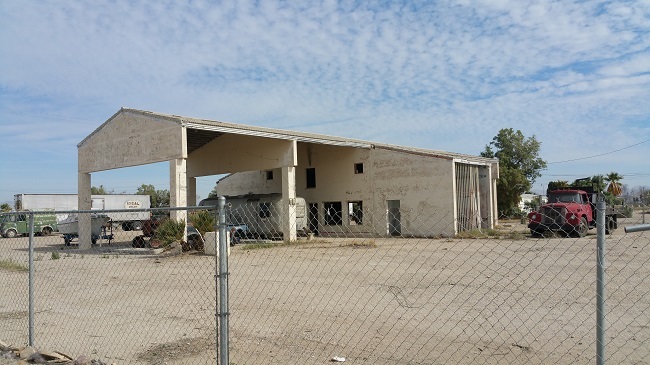 After I parked, I heard the echoing footsteps of someone running inside the building. I figured it was probably someone who wasn't supposed to be there, thinking I'd come to kick them out. I made sure I had my pepper spray handy and went inside. There were a couple of guys, one in his 40s and missing all his front teeth, the other and a skinny dude in his 20s. Both of them were wide-eyed with huge black pupils, even though it was a bright day. I acted casual so they wouldn’t be put on edge, and made it obvious I was just there to take pictures of the place. 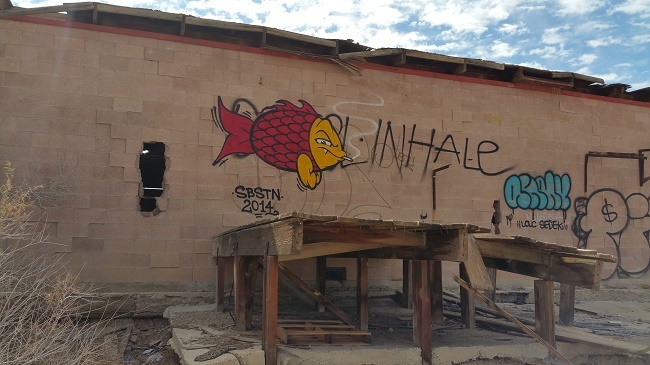 The younger guy proudly pointed out a mural he had painted of a fish smoking a cigarette. 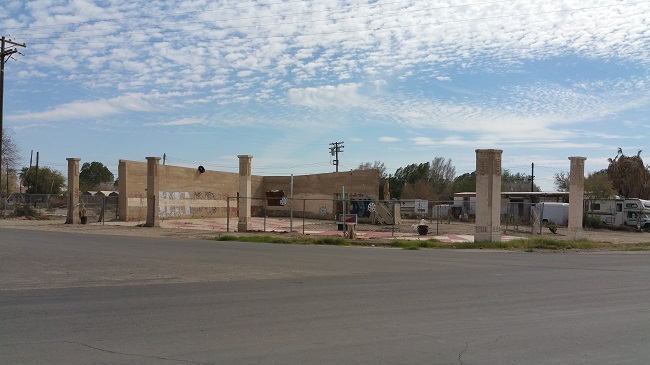 I asked the young guy where he lived, and he pointed to a well-hidden ramshackle structure he built out of wooden planks and sheet metal. I felt bad for him, so I offered to buy him lunch. He was extremely grateful. We went to a place called Buckshot Café, the only diner nearby. He told me a few stories about the difficult life he'd led, including a time he'd been stabbed in the neck, and showed me a nasty scar as proof. He said he used to do a lot of drugs, but claimed he had become a lot more responsible lately because he wanted to provide a better example for the daughters he had fathered. He had no job, but rode around on his bike, collecting cans and copper to redeem for cash. 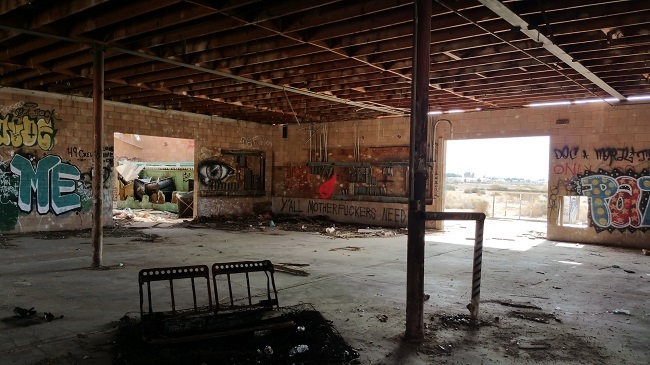 Niland was full of abandoned buildings and run-down homes that were still occupied. I wanted to check out the inside of this magnificent old building, but was deterred by the threatening snarls of a dog, which probably belonged to a squatter who had taken up residence inside. Tempted as I was to explore the whole town, I knew I had to be moving on if I wanted to finish exploring the Salton Sea area before the day was done. So I headed east to check out Salvation Mountain and Slab City.